In with the new, out with the old! Tonya Jensen, LPN, demonstrates how the new Omnicell unit at Fall River Health Services (FRHS) is used to order and retrieve medications for patients. 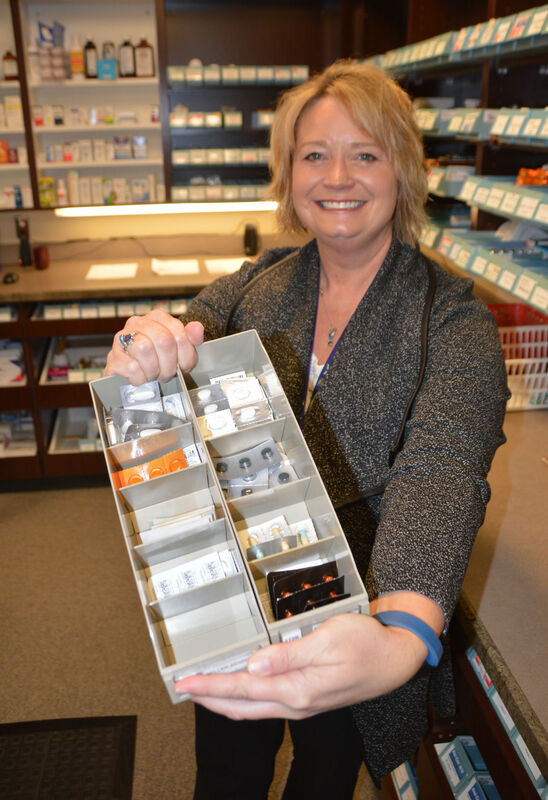 FRHS Pharmacy Manager Shelly Gardner holds up the old “pill boxes” the hospital used to utilize to organize and administer patient meds, which the new Omnicell unit has since replaced. HOT SPRINGS – In step with its ever-expanding range of services and technological advances, Fall River Health Service recently made great strides in patient safety and professional efficiency when it began utilizing a new Omnicell Automated Dispensing Cabinet system. The new technology is an automated system that allows providers to manage medications and other medical supplies on open shelves or secure automated dispensing cabinets which allows for quick, convenient and secure access for those who need it – 24 hours a day, 7 days a week. Despite being a standard feature at most large hospitals in the region, Omnicell technology is rare amongst smaller rural hospitals like Fall River Health Services (FRHS), according to Shelly Gardner, PharmD – Pharmacy Manager of Hot Springs. She credited not only the FRHS Board of Directors for making this possible, but also a very important $187,246 grant from The Leona M. and Harry B. Helmsley Charitable Trust. Gardner described the process and how the system works as basically the medical provider entering patient info into a computer, which is then sent to the pharmacy, where it is approved. That approval is then instantly transferred electronically back to the Omnicell cabinet, where lights are systematically displayed to show where medications and medical supplies can be retrieved by the provider from drawers on the cabinet using barcode technology, and then given to the patient. FRHS has three different Omnicell systems it utilizes – the largest one, with three cabinets, is located in the hospital; another is in the Emergency Room, with two cabinets; and the third is in the Nursing Home, which is the smallest. All three systems are available to be utilized 24/7 thanks to a partnership with ePharmacy, which allows the same real-time approval and dispensing of medications after hours and on weekends, when FRHS’s own pharmacy is closed. Lois Schmoll, the FRHS Health Care Information Systems Coordinator, who was also part of the Omnicell/ePharmacy Implementation Team with Gardner and some other FRHS staff, said the key feature of the new Omnicell system is how it helps to ensure patient safety by accurately analyzing the medications prescribed, approving them and then dispensing them. Schmoll and Gardner both described how antiquated the facility’s previous system was in managing a patient medications, whereas providers and pharmacists were still utilizing plastic pill boxes with separate compartments denoting days of the week. Gardner said last week that the Omnicell system has been fully operational at FRHS for four weeks. The initial implementation was a three-week process to get started, with the first week the installation phase followed by a one-week training and then a trial-run week. LPN Tonya Jensen demonstrated how the system works and expressed how excited she was that Fall River Health has now made the system available to the staff in Hot Springs. Jensen described how the Omnicell system allows LPNs like herself to be able to work directly with the pharmacy to administer medications to patients, which previously, she had to first go through an RN to do, making her work more efficiently. She also said how much more improved patient safety is with the Omnicell, as it helps to guarantee the right medications are given to patients. Another advantage of the Omnicell, according to Schmoll, is how the medications are auto-billed to the patient once it is entered electronically into the system. Storage of medications is also much more convenient and secure. Previously, Schmoll said, medications were stored in a back room. Now they are stored within the secure cabinet, located much closer to patients and providers. In addition to Schmoll and Gardner, other FRHS personnel on the Omnicell/ePharmacy Implementation team included: Yvonne Clyde, Certified Pharmacy Tech; Mike Medley, Environmental Management Mgr. ; Laura Cuny, RN – Clinical Informatics.